You don’t often get asked to check for hairs on the postero-dorsal face of the hind coxae but they are a very useful feature in some genera … and they can be really difficult for novices to see! Most tachinids will not have these hairs so you are left staring at your specimen wondering whether you can see any sign of hairs – or whether those hairs you can see are coming from another structure like the abdomen or femur. 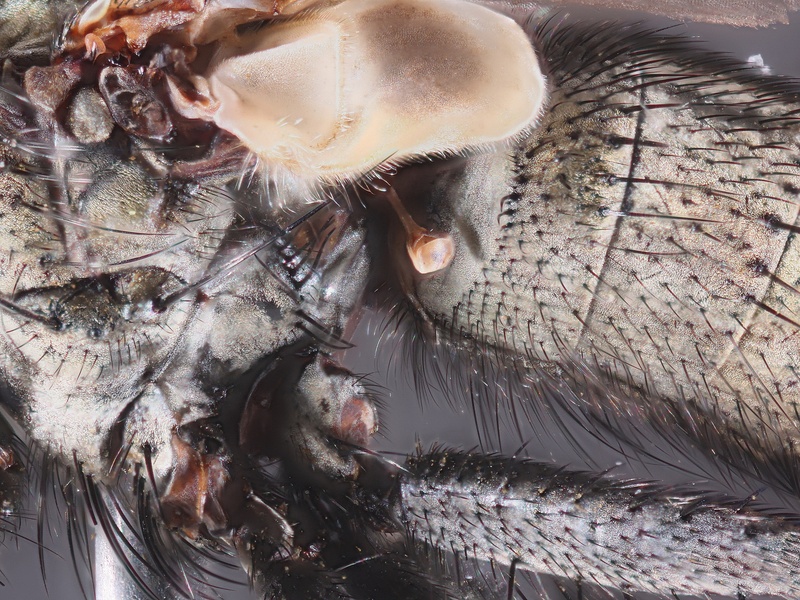 It can be made even mroe difficult if the legs of your specimen are all bunched up against the thorax. Remember to draw the legs away from the body when pinning your specimens! Sarcophagids often have this feature so, while identifying a Blaesoxipha plumicornis* the other day, I decided to take a photo of its hind coxae because they showed off the hairs particularly well. In this photo the head is off the picture to the left and you can see the pale calyptrae at the top and the haltere below it. To the left of the haltere is the fan of hypopleural/meral bristles protecting the hind spiracle. Below this is the hind coxa and if you look at the side facing the abdomen – the postero-dorsal face – you can make out quite a lot of short, black hairs. The sarcophagids often have more hairs than the tachinids but you can at least see where you are looking. If I can get some photos of a good Carcelia or Huebneria then I will show the very slight difference. * many thanks to David Notton for allowing me to photograph his excellently-prepared specimen and to the Natural History Museum’s Angela Marmont Centre for UK Biodiversity (AMC) for allowing me to use their free photo stacking system. 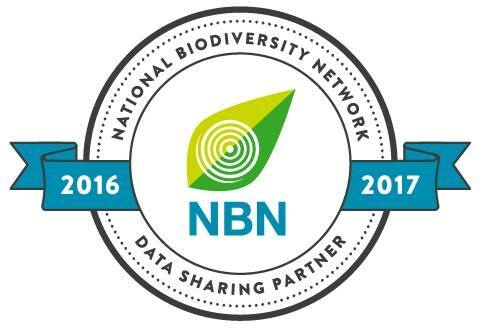 The AMC is a department of the NHM dedicated to supporting anyone who is interested in studying UK Biodiversity. Facilities are provided free of charge to amateurs.